A swashbuckling 151 from right hander Kevin Pietersen and good supporting knocks from Alastair Cook 94 and Jonathon Trott 64 has put England in a position of strength from where they can attempt to force a win and square the Two Test series with Sri Lanka. England cricketer Kevin Pietersen Sweeps the ball during the third day of the second and final Test between Sri Lanka and England at The P. Sara Oval Cricket Stadium in Colombo. At the close on the third day, at the P.Sara Stadium England was all out for 460 gaining a lead of 185 runs. Sri Lanka who made 275 in their first innings were 4 for no wicket in their second innings still trailing by 181 runs with Dhmmika Prasad who opened on no score and Lahiru Thirimanne also on no score in one over. There were 4 leg byes. Rangana Herath had 6 wickets for 133 in 53 overs with 9 maidens. Pietersen was in rollicking form. In fact it was a limited over innings that he played. His 151 came off 165 balls in 212 minutes with 16 powerful fours and six savage sixes. He has been signed on to play for the Delhi Daredevils in the IPL and was tuning up. He was out LBW to Herath. When Sri Lanka goes in a second time, the batsmen will have to be at their best to save this game and the series. Greame Swann could be the tormentor. With Kevin Pietersen on the rampage and favouring the reverse stroke or the switch hit, Dilshan who was the bowler, ran in and did not deliver. Dilshan was spoken to by umpire Asad Rauf. There was confusion when Dilshan stopped again which led to the umpires and Pietersen having a jaw. Pietersen on 98 reached his century with yet another switch hit off Dilshan. It was his 20th in Tests and came in the quick time of 125 minutes in 109 balls with 11 fours and 4 sixes. His fourth six was also off Dilshan. It is time that the International Cricket Council took note of this incident and made efforts to ban the switch hit from at least Test cricket, because it is not fair by the bowler and it is a ‘dirty’ shot at this level of the game. 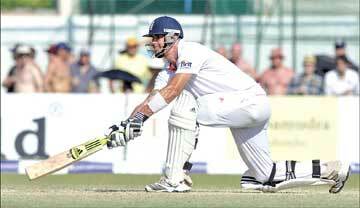 Pietersen was first cautioned by the on field umpires, for attempting the switch hit before the ball was delivered. He was officially warned after he attempted the stroke for the second time. If he or any of his team mates attempt a switch hit before the ball is delivered, they will give 5 bonus runs to the opposition. Match referee Javagal Srinath wanted Media Manager Brian Thomas to inform the media of the warning. The England overnight not out batsmen Alastair Cook 77 and Jonathan Trott 15 began in convincing fashion as there were terrors on the wicket and quietly began to grind the Lankan bowlers. Skipper Mahela Jayawardene handled his bowlers cleverly, switching ends and hoping for that important breakthrough. But it was not forthcoming, because Cook and Trott were not taking any undue risks. Left arm spinner Rangana Herath who wrecked England in Galle in both innings, bowled tight. There was a bit of spin and bounce on the wicket, but surprisingly Herath could not capitalize on it. Off spinner Suraj Randiv tried all his wiles, but he too failed to get lure the batsmen. It was part time off spinner Tillakaratne Dilshamn who proved the most impressive. He was flighting the ball well and obtaining spin which worried Cook and Trott. Cook was going well playing some well timed cover drives and seemed at ease, and on the way to another hundred, until Dilshan spun one viciously to take the edge of Cook’s probing bat for Mahela Jayawardene to pocket the catch at slip. Cook who was involved in a stand of 91 for the second wicket with Trott made 94 with 9 fours, made in 339 minutes and 278 balls. In the meantime Trott who was caressing the ball on the off for runs and playing some stylish cover and on drives reached his 50 and together with Kevin Pietersen who came in at the fall of Cook’s wicket took England to lunch on 239 for 2. Trott was on 62 and Pietersen 18. The first session provided 85 runs in 27 overs. After lunch Trott added four more runs when his innings came to an end when Herath spun one to take the edge of his bat for Mahela Jayawardene to swallow his second catch at slip his pet fielding position. Trott made 64 in 137 balls,187 minutes with 7 fours. He and Pietersen put on 40 runs for the third wicket. Once Trott departed, Pietersen showed his murderous intent, first by lofting Dilshan over mid-on for six and then repeating the stroke to clout Randiv for two sixes in the same area. Pietersen who was off colour in Galle, came into the form that he is renowned for and in reaching a quick 50 in 59 balls in addition to the 3 sixes hit 4 fours. It was batting luv’erly batting that brought the game and spectators to life. It was all Pietersen in the post lunch session. He was in a very aggressive mood and treated both pace and spin with scant respect spraying them to all corners of the park and over it as well with some daring and dashing stroke play. After lunch England lost Trott and Ian Bell. Bell was slow in going to 18 and trying to loft Prasad was smartly taken by Suraj Randiv at mid wicket. The Sri Lankan bowlers toiled hard in search of wickets but without success as the wicket had turned batting friendly. 6-411 (Pietersen), 7-419 (Bresnan), 8-454 (Swann), 9-458 (Anderson), 10-460 (Patel). Bowling: Lakmal 22-4-81-0 (nb2), Prasad 23-8-63-1 (w1), Herath 53-9-133-6, Dilshan 20-4-73-2, Randiv 34.3-4-107-1.